How Far is Bren Corporation Unity? 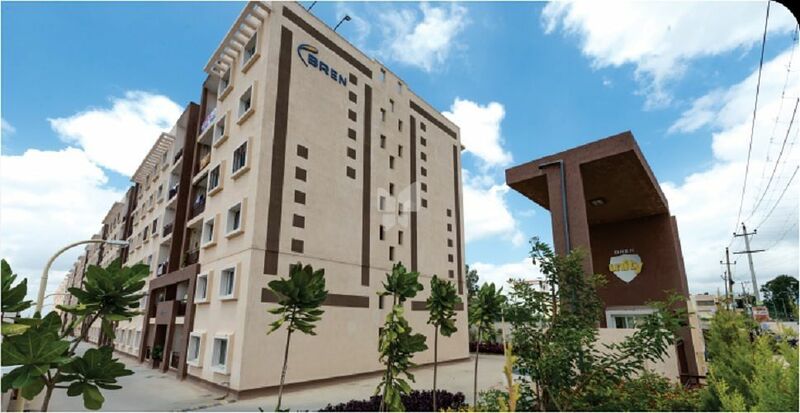 BREN Unity, a project of luxury 2 and 3 BHK apartments in the sought-after location of Marathahalli, Bangalore. Strategically located close to shopping malls and commercial establishments, and equipped with world-class amenities, BREN Unity is a place you would love to call home. Seismic zone II compliant RCC-framed structure. Concrete solid block masonry. Internal walls smoothly plastered with lime rendering. Interior with premium oil-bound distemper with roller finish. Exterior cement paint. Enamel paint for all internal doors. Teakwood door frame with teak-veneered (both sides) main door of melamine polish with premium fittings. All other doors - hard wood frames and flush shutters with enamel paint on both sides. Anodized aluminum sliders for balcony and windows with mosquito mesh. Vitrified tiles in living, dinning and all bedrooms. Ceramic tiles in all toilets, balcony and utility. Ceramic glazed tiles dado up to 7 feet height. White sanitary-ware of reputed make in all toilets. Also, Hot-cold water mixer unit for shower of reputed make. Provision for exhaust fan in all toilets. 20mm granite platform with single bowl sink will be provided.2ft high wall dado of ceramic tiles will be provided at cooking platform and sink areas. Provision for aquaguard, chimney & hob. Provision for washing machine in the utility. 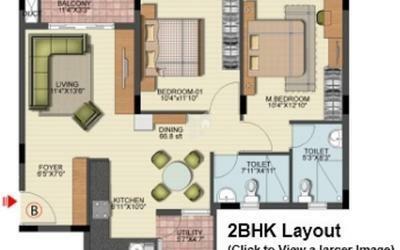 Power for each flat - 4 KVA for 3 BHK, 3 KVA for 2 BHK. Back-up power for each flat - 0.75 KVA for 3BHK, 0.5 KVA for 2 BHK. Fire resistance electrical wires. Elegant modular switches of reputed make. One earth leakage circuit breaker (ELCB) in each flat for safety. One Television and Telephone point each - in living and master bedroom. Stand-by generator for common areas, lift and pumps. One 8-passenger automatic lift of reputed make per block. Well-planned surface parking facilities for easy and efficient parking. In tune with NBC norms and standards. 24 hour security at the gate. Compound is fully enclosed and secure. Avenue trees, flower beds and lawns. Today, we have built some of the most prominent work, living and retail properties in the heart of Bangalore. In a crowded market of developers, we are defined by our exceptional customer service, which answers all your concerns, putting your needs on priority and your mind at rest. For 40 years, we've been in the business of building relationships. Not just between us and the people we interact with, but also amongst the people who use the structures we build. Buildings, after all, are no longer just about protecting us from the elements. They're about bringing people together and helping each of us realize our next big dream. The brand is not just about creating homes, workspaces and retail spaces. It is a way of thinking and creating, always. Our approach, Brennovation, drives our philosophy of development, as we continually innovate to enhance customer experience and quality standards. With expertise in development that stretches back three decades, in just four years we have built homes for over 6000 residents, delivering more than 2 million sq. Ft. and have planned developments of 8 million sq. Ft.